Botts' dots are round non-reflective raised pavement markers. Botts' dots may also be called turtles (Washington and Oregon) or buttons (Texas and other southern states). 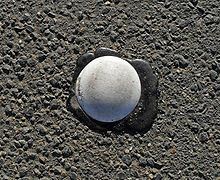 In many parts of the US and other countries, Botts' dots are used, along with reflective raised pavement markers, to mark lanes on highways and arterial roads. They provide tactile and auditory feedback to drivers when moving across designated travel lanes, and are analogous to rumble strips. Botts' dots are named after Elbert Dysart Botts, a California Department of Transportation (Caltrans) engineer credited with overseeing the research that led to the development of the markers. Botts' dots are most commonly white but may be yellow when used to substitute for the yellow lines that divide opposing directions of traffic in North America. The dots are made of various ceramic materials or plastics like polyester. On some roads, lanes are marked only with a mix of Botts' dots and conventional reflective markers, eliminating the need to repaint lane divider lines. Botts' dots are rarely used in regions with substantial snowfall, because snow plows damage or dislodge them. Botts' dots replace the painted median stripes. Reflective Stimsonite (darker orange) markers are spaced at regular intervals for increased visibility at night. Caltrans engineers may have studied the concept of raised pavement markers as early as 1936. However, the department did not commence research in earnest until 1953, when the postwar economic boom resulted in an alarming increase in the number of cars and car accidents in California. Painted lines tended to become invisible during rain. The initial dots were made of glass and were attached to the road by nails or tacks, as suggested by Botts. The nails were soon abandoned: his team discovered that when the dots popped loose under stress, the nails punctured tires. Contrary to a common myth, the published record does not make clear whether Botts invented the famous epoxy that solved the problem; some sources indicate that one of his protégés was responsible for the epoxy. In September 1966, the California State Legislature mandated that Botts' dots be used for lane markings for all state highways in all non-snowfall areas. Today, there are more than 25 million Botts' dots in use in California, though they have started falling out of favor. In 2017, Caltrans announced that it would stop using Botts' dots as the sole indicator of lane division, due to cost, worker safety, and in order to make roadways more compatible with self-driving cars. Reflective lane markings will be wider and thicker, providing some of the tactile feedback the Botts' dots provided. In California, highway lanes may be marked either solely by Botts' dots, or dots placed over painted lines. Four dots are used for broken lines on freeways, and broken lines on surface streets may use only three dots. Reflective Stimsonite pavement markers are placed at regular intervals between Botts' dots to increase the visibility of lane markings at night. In the Las Vegas area of southern Nevada, roads with multiple lanes use four pavement markers for each broken white line, a reflective Stimsonite marker followed by three Botts' dots. More recently, Botts' dots have been used in the snow-free areas of Alabama, Florida, Hawaii, Louisiana, Mississippi, Nevada, Georgia, Washington, and Texas. Some states that do experience snow, particularly Pennsylvania and Massachusetts, use Botts' dots only during the summer months for temporary lane markings in construction zones. Typically, the dots are installed when construction starts in the spring, and they are removed when work stops for the winter. In New Mexico, where snow is common in most locations during the winter, Botts' dots are used along with Stimsonite markers to outline gore areas at interchanges, but the state does not use either for regular lane markings on state highways. Some local jurisdictions (notably Alamogordo and Las Cruces) use Botts' dots and Stimsonite markers for regular lane markings on local streets. Botts' dots had also been employed previously in Albuquerque, but the city has since discontinued their use in favor of reflective paint for pavement markings. Until the late 1990s, Botts' dots were also used extensively in the snow-free areas of Arizona, however, ADOT has since ended this practice, opting for painted stripes with Stimsonite markers instead. However, they can still be found on US Route 95 south of Yuma, as well as on some local streets in Yuma and Tucson. Many states in snow-prone areas of the Midwest and Northeastern United States use Stimsonite reflectors placed into protective metal castings, which allow them to be plowed over without being dislodged from the road surface. These pavement markers are usually augmented with reflective paint and delineators placed on plastic or metal posts at regular intervals along the edges of the road. In California and other locations in the Southwest United States that experience occasional but significant snowfall, the Stimsonite reflectors are placed into recessed pockets in the roadway, which allows visibility during dry weather but permits a plow blade to travel across the reflector without dislodging it, with no special protective castings needed. ^ a b c Stein, Mark A. (August 11, 1991). "On the Button: The Quest to Perfect Botts' Dots Continues". Los Angeles Times. p. A3. ^ a b c Haldane, David (March 7, 1997). "Dots' Demise Denied". Los Angeles Times. p. B1. ^ Rubenstein, Steve (January 18, 1997). "Caltrans Plots to Erase Lots of Botts Dots". San Francisco Chronicle. p. A13. ^ Richards, Gary (January 18, 1997). "It May Be End of Road for Noisy Botts Dots". Contra Costa Times. p. A3. ^ Winslow, Jonathan (May 21, 2017). "Botts' Dots, After a Half-Century, Will Disappear from Freeways, Highways". The Orange County Register. Retrieved July 19, 2017. This page was last edited on 1 January 2019, at 20:12 (UTC).